In my previous post I reported of a field visit to regional training provider organisations with a prominent delegation from Namibia. I joined the group partly because I needed to arrange meetings with vocational teachers and trainers from both organisations. With the help of these meetings I wanted to revisit the materials from the training activities of the EU-funded Learning Layers project (2012-2016). My aim is to develop with a future-oriented training concept for promoting digital competences of teachers and trainers in vocational education and training (VET). With the trainers in the training centre Bau-ABC I can refer to our shared experience in implementing training schemes during the Learning Layers project and to the introduction of the digital toolset Learning Toolbox (LTB). With teachers of BBS Wildeshausen I was interested of other pedagogic solutions and of the use of Open Educational Resources (OER). These all should be taken on board when preparing the support materials for developing continuing professional development (CPD) to promote digital competences of teachers and trainers in the field of VET. When listening to the contributions of the teachers and trainers during the field visit I got more and more convinced that such materials should not be shaped as overarching ‘encyclopedia’ of digital tools, web resources and mobile apps. Also, I understood that the materials should not be written in the style of cookbooks with ready-made recipes. Instead, they should be well-selected and contextualised exemplary stories that inspire the readers to find their own solutions. And these solutions should give a picture, how to use appropriate toolsets and web resources for the respective vocational learning environment. Also, these materials should open the perspective to using digital tools and web resources from the initial steps to first strategic choices and to wider use of tools, resources and complex teaching-learning arrangements. From this perspective I started to outline an updated and extended training model based on the “Theme Room” metaphor that we used in the Learning Layers project. The ‘theme room’ can refer to a physical space or to a virtual space that has been made available for a selected theme and for a flexible time frame. Once the participants have completed the learning tasks and checked themselves out, the theme rooms can be furnished with other themes. That was the original idea. TR1 – Entrance lobby: Getting used to work with some basic digital tools and apps – with the aim to make use of them in one’s own teaching or training activities. TR2 – Integrative toolsets: Working with integrative toolsets that guide the shaping of entire learning arrangements – such as the Learning Toolbox or the Kompetenzwerkstatt toolsets. TR3 – Enriching web apps and platforms: Working with apps, tools and platforms that help to make learning tasks more inspiring and challenging – such as the toolsets provided by Go Conqr and H5P platforms. TR4 – Shaping complex teaching-learning arrangements: Working in learners projects that involve construction of new tools/devices or manufacturing of new products that can be used in learning contexts. TRn – Future workshops on palternatives for digital transformation in one’s domain: Whilst enhancing one’s own digital competences in the context of vocational learning tasks or project, it is necessary to keep an eye on the big picture of transformations in entire production and services processes & networks. I guess this is enough for a rough structure. As I said, this should not be seen as a basis for a ‘cookbook’ or for a ‘product catalogue’ but as an introduction to explorative learning in order to find one’s own solutions and in order keep oneself on track with new developments. This is the challenge – there is work to be done in the meetings with teachers and trainers. This week our institute – Institut Technik & Bildung (ITB) of the University of Bremen – has hosted a study visit of a prominent delegation from Namibia. This study visit is part of a cooperation process that has been started with smaller steps and now there is an ongoing discussion, how to deepen the cooperation. As I have not been involved in these discussions I leave it to my colleagues and to the Namibian authorities to find the bast ways forward. As a part of their program the delegation visited on Tuesday two interesting organisations in the nearby region. With the training centre Bau-ABC I had had active cooperation for many years in the EU-funded Learning Layers project. But in the follow-up phase I had only had a chance to make some occasional visits. As a contrast, I had not visited the vocational school BBS Wildeshausen before. Instead, I had had several conversations with one of the teachers who is also working in several projects of our institute. By joining the study visit group on Tuesday I had a chance to catch up with newer developments in Bau-ABC and to get live impressions from BBS Wildeshausen (of which I knew only via our talks in Bremen). Below, I will give a brief account of the visits in both places. In my next post I will outline some conclusions for my work in the ongoing EU-funded project TACCLE4-CPD. At the training centre Bau-ABC Rostrup the delegation was interested in finding out, how such an intermediate (industry-supported) training centre has been embedded into the dual system of vocational education and training (VET). Here, the representatives of host organisation were able to give a picture of the mutual agreement of the Social Partners (employers’ confederations and trade unions) that such an intermediate learning venue was necessary in the construction sector. Likewise, they could explain funding arrangements and the organisational setting via which the industry and the craft trade companies were supporting the training centre. In addition, the visitors got a picture of the role of the training centre at different phases of apprentice training. Finally, the visitors got insights into the continuing vocational training (CVT) that provide a vocational progression route to managerial qualifications in the construction sector. During our round tour at the workshops and outdoor training areas we could see, how the pedagogic ideas were put into practice. We got impressions of apprentice training via holistic occupational work processes, of learners’ rotation from major learning areas to supporting areas and of the patterns of self-organised learning. In particular we had a chance to see, how a digital toolset (the Learning Toolbox) was used in delivering instructions and collecting apprentices’ project reports. Here we could see that results of the EU-funded Learning Layers project were actually used to support training. The second part of the visit was somewhat different, because only some teachers of the BBS Wildeshausen were present (the school holiday period had already started). Yet, we had a good possibility visit the integrated vocational learning facilities of different occupations. In Wildeshausen the school architecture had abolished the separation of classrooms, workshops and laboratories and instead provided integrated spaces. This was already a great support for integrating theoretical and practical learning. Yet, the major innovations that were presented to us were in the pedagogic sphere. When describing the learners’ projects the teachers drew attention to the role of real occupational tasks and to controlling the quality by the learners themselves. Moreover, some projects engaged the learners in constructing devices that were needed in their training or in manufacturing products that could be used in the training. In the agricultural and automotive workshops we saw vehicles that had been constructed by nearby industries to make the functioning of the machinery more transparent (and to give easier access for diagnostic measures and repair work. I guess this is enough of the observations during the field visit. The visitors from Namibia were very impressed and inspired. Since they were in a process to start new cooperation activities, the visit gave a lot of food for thought. As for me, I had joined them to make appointments with Bau-ABC trainers and teachers in BBS-Wildeshausen to discuss the next phase of my work in the TACCLE4-CPD project. And in this respect this was a very productive and helpful field visit. I will discuss my ideas and interim conclusions in my next post. Last week our EU-funded project TACCLE4-CPD had its third transnational project meeting in Pontypridd, Wales. I have reported on this project in my earlier blogs (December 2017 and June 2018). We are developing frameworks and support for continuing professional development (CPD) of teachers and trainers in promoting their digital competences. As I have told earlier, this project is based on the work of three earlier TACCLE projects that provided direct support for teachers in integrating digital competences to their teaching. This project has the task to develop frameworks, concepts and support resources for CPD measures in different educational sectors (general education, adult education and vocational education and training (VET)). And as I have mentioned elsewhere, the success of all TACCLE projects has been based on the founding work and intellectual leadership of Jenny Hughes. In this respect our meeting was located to Pontypridd to meet Jenny at her home grounds and to make contacts with her local counterparts. Sadly, we lost Jenny shortly before the meeting. In the new situation we had to make a new situation assessment plan our work without counting on Jenny’s active support. Below I try to summarise some key points in our general discussion on the main Intellectual Outputs of the project. In my next blog I will discuss my contributions to the project and how they are related to this discussion. What does ‘developing CPD’ mean for the project? To be sure, we had discussed already in the first meetings the aims of our project and the background from where the project idea arises. Yet, at this meeting we had a special need to revisit these discussions. And here we were partly guided by Jenny’s legacy. In an earlier video interview she had told of the time lag between the proposal for the TACCLE1 project (for supporting the development of e-learning content for classroom teaching) and the actual start of the project. During that period the introduction of Web 2.o tools had taken off massively and the project had to catch up with this development. According to jenny, this was managed and the project integrated introduction to Web 2.0 tools into its original idea. In our project meeting we found ourselves facing a similar challenge. Initially the TACCLE4-CPD project had been planned to scale up the work of the TACCLE courses and related local and regional teacher training activities. Whilst some sections of the proposal were referring to policies, strategies and management choices, other parts were very close to planning specific training activities and support materials for classroom teachers. However, the key idea was to proceed one level up in making transparent the policy choices for shaping training programmes, providing organisational learning opportunities and for linking them to progression models. And as we now saw, it several international organisations were active in mapping this landscape, developing new frameworks and in promoting pilot activities. These newer developments provided us a challenge in keeping up with the discussion and linking our work to it. Below, the implications for two Intellectual Outputs are discussed in this respect. Implications for our work with Policy Analyses, Route Maps, Frameworks etc. Concerning policy analyses we were aware of the problem faced by many European projects when they had provided national reports presenting the education and training policies of their countries. Although the aim of these reports had been to inform each other and to faclitate mutual learning, they often highlighted systemic differences and strengthened cultural barriers. From this point of view it was important to get insights into new patterns of sharing policy concepts and adapting policies that had been trialled in other countries (as Graham Attwell reported on the work of Unesco with a group of East-African countries. Also, for our common understanding of ‘policy learning’ it was important to share information on the European DigCompEdu framework that promotes new kinds of developments across different systemic frameworks. specific policies for promoting competences of teachers and trainers (with emphasis on digital competences). In this context the specific ‘Routemap’ and ‘EMM-framework’ concepts that we had discussed earlier, could be seen as part of a wider group picture and could be linked to other elements. Thus, we could see the seemingly separate tasks as mutually complementing elements within an integrative framework. Also, we could see that the Mindmap could guide different users to find their levels of activity, perceive the dependencies and chances as well as address questions and outline options. In a similar way we revisited the question, how to create collections of Open Educational Resources for TACCLE4-CPD. In the earlier TACCLE projects it was clear that the OER collections should equip teachers with teaching materials and pedagogic advice for their work. To some extent this emphasis was present in the proposal. However, as a consequence of the newer developments at different policy levels – and due to newer approaches to ‘policy learning’ – there is a demand for OER collections that cover different levels and address strategic dependencies and/or opportunities for pioneering. From this perspective we concluded that the work with the Mindmap is also the core structure for shaping a collection of OER (with sufficient amount of commentary). I think I have grasped above the crucial steps in revisiting the proposal and reworking our way further. Based on these new perspectives we could see, how many elements of our work were growing together. Also, this discussion helped us to see, how to link input and influences from earlier or parallel projects to our work. In that sense I could see more clearly the importance of the work with the Learning Layers project and its follow-up measures. I will discuss this in my next post. Last Sunday we got from Graham Attwell the sad news: Jenny Hughes has passed away. As we know it, Graham is a long-time friend of Jenny over decades. In his blog Graham has already given us a picture what all Jenny has been up to during the years they have known each other (see Graham’s recent blog post). I have also known Jenny and Graham quite some time – our cooperation dates back to the year 1996 when I started monitoring EU-funded cooperation projects as a project manager of Cedefop (European Centre for the Development of Vocational Training). Little did we anticipate, what all we would experience together in the years to come and what kind of initiatives we could bring forward. Below I try to cover some of the main themes with which we have worked together in the field of vocational education end training (VET). In this context I will try to give a picture, how Jenny has contributed to European networking and community-development through all these years. The first time I met Jenny (and also Graham) in Bremen in January 1996 in the kick-off meeting of the European cooperation project “Europrof”. The project was initiated by Institut Technik & Bildung (ITB), University of Bremen, but they chose to employ Graham as the coordinator. Jenny was representing the UK (Welsh) partner organisation. I was representing Cedefop – as an additional accompanying researcher. The aim of the project was to shape a new integrative framework for VET professionals – to overcome the divide between teachers (in school-based education) and trainers (in workplace-based training). The conceptual starting point inspired many European colleagues to join in at a later stage – as affiliated expert partners. However, the project had difficulties in working its way forward from a critical ‘state of the art analysis’ to a realistic change agenda that could be adjusted to different VET cultures. Yet, the work in the Europrof workshops prepared the grounds for a Europe-wide ‘invisible college’ and community-building process that was continued in other projects. In the beginning phase I remember that Jenny was critical about the ‘European English’ terminology that we (non-native English speakers) were using. It took some time for us to understand that we were not disagreeing on the underlying ideas but instead we were not aware of the connotative meanings in British English – that made our message weaker or diluted it altogether. Once we understood this, we were happy to work with Jenny on our side. The Europrof project had tried to outline an integrative change agenda for promoting education and training for new VET professionals (covering the school-based and workplace-based VET). The successor projects tried to develop a differentiated approach – addressing teachers and trainers in VET as different target groups. The TTplus project (2006 – 2008) was initiated by Graham (now representing Pontydysgu and bringing Jenny with him). I joined this project as a freshman in ITB, based in Bremen. In this project we looked at the instances of change and interests that we could trace in different countries – in order to draw common conclusions. In this project Jenny provided insights into the training practices in Welsh organisations and outlined a framework for continuing professional development (for countries that did not have strong established frameworks at place). A third phase of such European cooperation took shape in the European Consultation seminars 2007 -2008. The European Commission had decided to launch a consultation process based on six ‘regional’ workshops involving EU Member States and EFTA cooperation partners. The workshops had the task to bring different stakeholders to joint discussion on the role of European policies in promoting the professionalisation of teachers and trainers in VET. The project was led by ITB and supported by Pontydysgu. In the light of the difficulties that we had experienced in previous projects it was of vital importance that Jenny was able to shape a set of interactive workshops that kept the participants busy in common discussion instead of getting stuck with institutional and systemic differences. Mapping of concerns of teachers and trainers: What are the issues – what are common to both, what are different? The issue cards were written and set on the wall – illustrating the sense of commonality or relative distance between teachers and trainers. Witness sessions: Participants reported of recent reforms in their countries and of current European projects that they perceived as innovative. Problem and Solution cards: Participants wrote on one side of the card a pressing problem and on the other side a possible solution. These were then discussed in groups. Mapping policies: On a matrix the participant groups were asked to indicate, what European policies do more and what less and what national policies should do more and what less. Taking a message home: Participants were asked to formulate their own conclusions as messages to take home. Self-evaluation of the workshop: Participants indicated on flipchart, what had worked well and what was less well in the workshop process – and the process could be improved. During the workshops the participants worked mostly in mixed groups and language support was provided on demand. Also, at different phases of the process that participants changed groups. In this way the workshop stimulated cross-cultural dialogue and knowledge sharing on key issues and emerging initiatives. The participants emphasised the value of such process and hoped that it would be continued. Unfortunately the Commission services were expecting the process to deliver a Common European framework that would make such exchanges gradually redundant. Another key theme for Jenny has been the promotion of teachers’ and trainers’ competences in e-learning – remote learning, open distance learning, multimedia learning, e-learning, technology-enhanced learning – whatever it has been called at different times. The major flagship projects in this context have been the TACCLE projects (I will get back to this in my next blog) and the related TACCLE courses. In these projects and in the supporting courses Jenny had the chance to shape handbooks, web-based support materials and workshops that brought the e-learning competences ‘home’ to the work of different teachers and trainers. 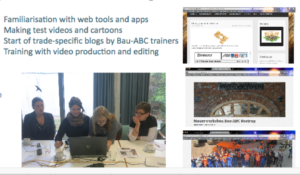 As a personal memory I can refer to the Multimedia Training workshops that Pontydysgu and ITB organised together for the full-time trainers of the training centre Bau-ABC Rostrup in Germany. The lively approach that Jenny radiated throughout the training made the construction sector trainers do their best to get something useful for them in their own work. At a later phase of the Learning Layers project these pioneering trainers served us the champions in introducing the digital toolset Learning Toolbox to their training. And later on they have served as peer tutors in their own organisation and multipliers in a wider context. One important aspect in Jenny’s career has been her role in European networks and community-building processes. She may not have pushed herself into the representative positions but yet her contribution has been vital. I still remember the start of the European “Forum” network that was launched in 1995 as a ‘learning community’ for European researcher. This network tried to avoid premature institutionalisation. Instead, it developed a culture of regular thematic workshops – and included specific workshops for emerging researchers. Gradually, it became necessary to apply for funding and to develop a formalised structure for thematic knowledge development – and in this way the project-specific goals for producing publications in each work package took over the process dynamic. During this development Jenny was trying to maintain the culture of ‘learning community’ and resist the atomisation of the network. Throughout her career Jenny has been remembered as an advocate of ‘real life wisdom’. She took seriously the challenges of academic knowledge development but at the same time she always work together with practitioners and supported their development. We have lost Jenny but her legacy inspires us from now on. With my previous posts I started to write a serious of blogs with the heading “My journey with Institut Technik & Bildung (ITB)”. These blogs are intended to support the work (or follow-up) of the ITB “Klausurtagung” that will take place on Friday 9. December 2016. The inspiration to write personal blogs that deal with the history of ITB comes from the Klausurtagung 2015. With this series I try to compensate my absence due to health issues and to pass a message, wah has happened at different times and with different themes. In the first post I tried to cover my first encounters – my study visit in 1989 and participation in the Hochschultage Berufliche Bildung 1990 conference. In the second post I gave insights into the Modellversuch Schwarze Pumpe and to related European cooperation projects 1995 – 1999. In the third post I discussed the Europrof project, the Unesco International TVET meeting in Hangzhou 2004 and its follow-up. In the fourth post I will discuss the development of our work from the TTplus project to the European Consultation seminars on VET teachers and trainers in the years 2007 – 2010. My first encounter with the theme “Teachers and trainers in VET” at European level took place, when I was working in Cedefop (European Centre for the Drevelopment of Vocational Training) as a national seconded expert sent by the Finnish government. Cedefop was being relocated from Berlin to Thessaloniki, Greece and I had just got a new contract with which I would start as a temporary official of the EU in Thessaloniki. At that time the Cedefop project manager who was in charge of the newly started project “Teachers and trainers in VET” asked me to take over this project since she was leaving Cedefop and moving to Eurostat. For her this was a project to be completed when the national reports for all countries are completed. When I had joined the project, I realised that there was a strong community-building process going on and that it should not be dropped. Yet, I had already got my activities in VET research cooperation started (accompaniment of European projects, joint synergy seminars with top projects, participation in European policy dialogue events with the projects) and I couldn’t concentrate sufficiently on the practitioner network. After a lengthy transition period another Cedefop project manager took over this project and managed the official launch of the TTnet network in 1998 (based on the preparatory work in the years 1995-1997). From that point on the TTnet seemed to be the natural address to collect European studies and expertise on the theme ‘teachers and trainers’ However, there were two major limitations in the way that the network had been constituted. Firstly, following the Cedefop tradition, the network was built upon national contact points that coordinated the activities and eventually invited further actors. This was a somewhat exclusive mode of participation. Secondly, it was left to each country, whether the contact point is hosted by institutions for vocational teacher education or major training organisations (with ‘training the trainers’ activities) or national VET authorities. As a consequence, the national contact points covered the field from the perspective of their own priorities. When the European Commission in the years 2005-2006 was looking for ways to analyse more closely the role of VET teachers and trainers as a target group for European policies, these measures were not crried out via TTnet but via new priorities in the Leonardo da Vinci programme and via specific tenders (which also were open for the TTnet members as well). From the thematic pointof view, special emphasis was given on measures that focused on in-company trainers or on trainers in specialised training organisations (beyond the initial VET). This was the background for the many parallel activities on the theme ‘teachers and trainers’ that were carried out by ITB in the years 2006 -2010: The Eurotrainer I survey, the TTplus project, the Consultation seminars and the Eurotrainer II network. Below I will focus on the TTplus project and the Consultation seminars in which I had a major role. The TTplus project was set up with the ambitious heading ‘Framework for continuing professional development of trainers’ and building upon the experiences of the Euroframe project (see my previous post). The project took into account from the beginning the fact that the patterns for employing trainers (for workplace-based learning) and the respective arrangements for ‘training of trainers’ vary to a great extent. Therefore, The empirical work was based on three case studies to be carried ou in the particpating countries – then to be followed by policy analyses, reflections on the role of European Qualification Framework (EQF) and recommendations. In Germany the exisiting framework for training of trainers (AEVO) had been teamporarily suspended (in order to encourage the companies to take more apprentices. The companies that were studied were interested in supporting training of trainers – and used AEVO as a basis. Yet, they saw AEVO as minimum and were looking for more. In Portugal the partners studied private training providers who organised employment schemes commissioned by the employment services. The trainers’ aptitude certificate (CAP) required as minimum standard tended to reduce the pedadgogic room for manoeuvre to traditional frontal teaching. In Greece the companies studied were not subject to follow any government policies regarding in-company training – this was up to company-specific decisions. Likewise, it was up to the companies to engage trainers and to consider the competences of trainers from their perspectives. From the analyst’s point of view there was a case for a government intervention to to introduce minimum level training obligations and minimum standards for trainers. In Wales the companies contacted had outsourced most of their training activities and these were catered for by freelance-trainers who had developed their career as allrounders (from the content point) and as training technique specialists. Whilst they were in the position to outline frameworks for professional development (but were sceptical whether such frameworks should be applied to freelance trainers). As these examples already indicate, the European landscape of training at workplace and ‘training of trainers’ was getting more colourful and it was not self-evident, how to promote European policies in an effective way. The approach of the project made it possible to get insights into the training contexts (companies, training providers, training arrangements) and to collect working issues. This all served as good preparation for the forhcoming European activities. in the light of the above it was apparent that the ‘European dimension’ of the project TTplus was not to set common European standards for trainers – neither was there a case to declare a common recommendation for continuing professional development. Instead, the project provided an overview of the challenges and eventual steps forward in different countries (taking into account the organisational, institutional and policy contexts). In this respect the analysis on the role of the problems in applying European Qualification Frameworks (EQFs) to the field ‘teachers and trainers in VET’. Whilst in several countries, VET teachers were educated in universities or higher education institutions, this was not the universal rule across Europe. In this respect the EQF for Higher Education (the Bologna process) provided the general framework. Yet, considering the career models of VET teachers, there was a tension between study programs for full-time students vs. professionals in the middle of career shift. For the same reasons the European Qualification Framework for VET (or lifelong learning) did not provide an orientative framework for career progression – neither within the context of workplace training nor regarding career shift from training activities fro teacher duties. In this respect the German country report made transparent the initial discussion on such career models (and how to support them with different national frameworks). However, the discussion was at early stage and ITB got at that time linked with the developmental initiatives (after the TTplus project). In the light of the above it is interesting to note the opportunities provided by the Europe-wide Consultation seminars “VET teachers and trainers” in 2oo8 – 2009. This was a European Commission initiative to pull together knowledge and different stakeholders’ views via series of ‘regional’ workshops that cover all Members States, EEA partners and candidate countries. ITB won the tender with a consortium based on the Eurotrainer projects. The task was originally to organise six regional workshops to cover different European regions and to draw conclusions from hitherto implemented policies and intiatives for common European initiatives. The expectations were rather high regarding conclusions that could support incorporation of VET teachers and trainers into EQFs or under specific EU-level ‘communications’ (from the Commission to the European Parliament). Statements on the wall: Collection of statements on the roles, tasks and development prospects of trainers – collected and grouped on the wall under respective headings – reflections on different positions and groupings. Witness sessions: Quick presentations on recent innovations/initiatives/pilots that the participants bring from their home countries – what were the strengths/weeknesses, what made them sustainable/fragile. Mapping European policies/initiatives: Participants were asked to fill in ‘problem’ cards, ‘method/measure’ cards and ‘policy’ cards to outline proposals. The groups collected and grouped the results. Priority ranking: Participants were asked to indicate European ‘priorities’ that had been high and should be kept high vs. had been high but should be lowered vs. had been low and should be topped up vs. had been low and should be kept low. These were some examples of the activities that were managed in the workshops. Altogether they gave the participants a good feeling that their views were respected, their contributions were taken on boards and the the groups worked together. Indeed, as ‘regional’ and trans-national workshops for knowledge sharing and dialogue the events served very well. However, the problem was in brining the European policy level into discussion and developing the feedback processes in such a way that European policy-makers could draw conclusions for their work. I think this is enough of the projects and activities of this period. They were rich learning experiences but showed major difficulties in working towards a European synthesis – and at the same time shaping recommendations for development activities in particular VET contexts. This challenge will be explored in the forthcoming blogs.